As a student, I loved mission trips. They were some of my most formative experiences, and though they were tiring and at times emotional, I think back on them with fondness. I made friends, some of whom I corresponded with for some time afterwards, and had so much respect for the leaders. They were Adults, in charge, and, I assumed had their lives put together, spiritually and otherwise. Now, as I get ready to go on my first mission trip in several years—this time, as a leader—I realize how mistaken I must’ve been about my leaders. All my feelings about this trip, of nervous excitement and wondering if everyone will get along and if God will break in like I’m sort of hoping he might and secretly crossing my fingers that I won’t have to mow lawns, feel much more like those of a teenager than of an Adult. Except now I have the added responsibility of having to actually sorta kinda be in charge of things on top of it all. I think it escaped me that my leaders were real people too. Sure, I heard them talk about their jobs or their families or what God had been teaching them, but I never stopped to really think about them as human beings. They were just leaders. Now, as I stand on the other side, I am entirely aware of my very humanness. I would so much like to be able to set aside all my own feelings about the trip and focus 110% on doing these service projects as best as possible and making sure it’s a great experience for the students, but there’s so much ME getting in the way. Once I’m actually there, I imagine my priorities will shift—out of necessity somewhat, but also, I hope, out of God correcting me as I move along throughout the week. But that’s part of it too. As much as I think I’d like to have God blow me away with the ways he shows up, it kind of terrifies me too. It’s been a while since I’ve felt God in a big way, and I hardly remember what it’s like. I’ve put God into a corner, where I expect him to act in predictable ways that don’t unnerve me, but I’m standing on the edge of a time where I suspect he very well might blow the whole room, much less that corner, to bits. Which I want, only without the uncomfortable unsettling that goes with it. But I don’t think I can have one without the other. Part of me wishes I could take this all a bit less seriously, but I simply can’t–and really, I’m not sure I’m supposed to. I am a real person, and these are real, live students I’ll be hanging out with. We’ll be working on actual houses and lawns and parks that are lived in and run on and played in by actual people. We’re going with the mindset that a real God is going to show up for all these people in very real ways. There’s a weightiness to all of it. I wish I had a neat, tidy ending to this post, but the rest has yet to be lived. I’m going to have to figure this out as I go. p.s. Have any tips for a leader about to go on a mission trip? There’s something about seemingly significant purchases that make me feel All The Feels about being single. Last time, it was a mixer. This time, it was a hammock. I spotted it in a Groupon Goods email. “It’s just a hammock,” I told myself. But I’ve been dreaming of hammocks for a while, or perhaps, more accurately, of the lifestyle a hammock seems to represent. In my current house, the backyard doesn’t have the right trees for a hammock, and hammocks with stands cost more money. I didn’t know where I’d be living next, so I didn’t want to buy a hammock and not have somewhere to put it. Recently, though, I decided where I’ll be living next, and not only is there space for a hammock outside, there’s space for it inside. In a spacious basement that’s just crying out for a hammock. Yet, when I spotted the hammock (and stand!) for $100, it was not an immediate decision for me. Did I want it? Certainly. Did I have $100 to be throwing around on such frivolities as a hammock? Somewhat debatable. And still, I waffled. As I contemplated the purchase, I had the somewhat-overwhelming realization that, though I could get input from as many people as I liked, the decision was mine. Mine and mine alone. Which is both the awesomeness and the frustration of being single. With something like a hammock, it was awesome. 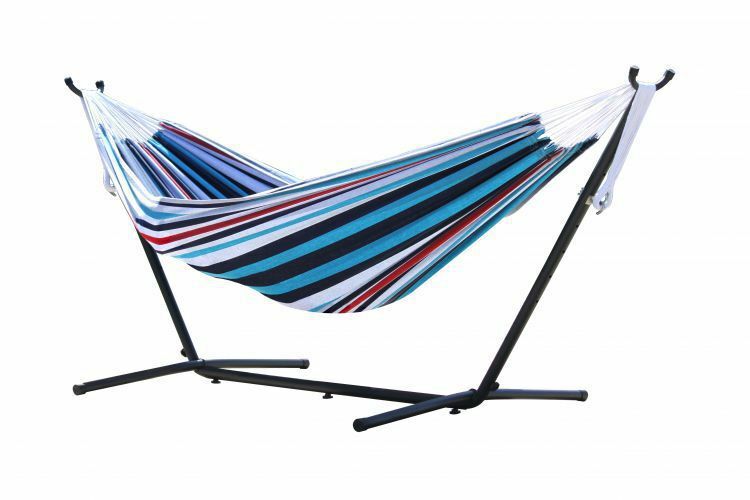 I didn’t have to consult another person about the state of “our” bank account, or try to justify the expenditure and explain how much enjoyment I would get out of the hammock and how long I’ve been wanting one and how it’s a good deal and the stand should last even beyond the hammock itself. I used all of these arguments to rationalize it to myself, but I didn’t have to present these to someone else. It was my decision. There are some decisions that are a little less freeing to have to make completely on my own, though. When trying to figure out where I should live next, I talked over my options with various people, but ultimately, the decision was mine. And it felt kind of big, and a little intimidating, to be the only one who had anything depending on the decision. I’m pleased with where I’ll be living and think it will be great, yet sometimes I still don’t feel old enough to be completely in charge of my own life. Sometimes it still startles me that I’m a person who has a full-time job and health insurance and makes decisions about where to live all on her own and buys mixers and hammocks. I know how old I am, of course, but I don’t always feel that old on the inside. p.s. Do you like making decisions all by yourself, or do you prefer to have someone to make the decision with? As a teenager, I read all the Sisterhood of the Traveling Pants books. To say that I loved them might be a bit strong, but I certainly enjoyed them. There was something about their tight-knit, started-at-birth, years-spanning friendship that appealed deeply to the teenage me who had friends, sure, but not many who had been around for a considerable length of time. And so, I was recently pleasantly surprised to discover a fifth book to the series, set 10 years after the last one. Here they were, these girls I hadn’t thought about probably in years, suddenly catapulted to an age just a few years ahead of my own. They were the same as I remembered them in many ways, but as we all do as we age, they had changed too. Almost like they were real. As the book recounted the ways their relationships with each other had cracked and mended and changed over the years, it felt so near. Because I know those things, too. Friendships get weird when you’re a twenty-something. Suddenly the built-in place to make them, of shared classes and clubs and dorms, is gone. Many people scatter, to new places and new phases and new faces. And you scramble a bit, trying to hold onto the ones who have become so much a part of you that you can’t imagine life with them, and you learn the difficult lesson that some friendships are only for a season and that’s okay, but the line of which ones are which is thin and painful to find. There is fear, too. Fear that this move, this relationship, this new job will be the one that somehow makes the divide between two friends a little too big, a little too far to bridge with texts and phone calls and coffee dates. People change and relationships do too, and there is goodness there, but hardship too. And sometimes it comes in ways you didn’t expect or invite. But, this book. This unexpected discovery. I saw myself in the characters I’ve know for many years, and in them I found hope, too. These are fictional characters, of course, born in the imagination of the author and only truly existing in the minds of readers, but I think the best kinds of books are the ones we’re invited to see ourselves in. Things had changed for these characters, time and time again, and still they found their way back to each other. Never in exactly the same way as before, but somehow. It wasn’t without pain or missteps along the way, but it happened. And it makes me a little less fearful. Maybe, as I continue through my twenties and beyond, my friends and I will continue to find our ways back to each other too. p.s. Have you ever found the hope you needed in a book? Birthdays are funny things. In a few hours from when I’m typing this, I will officially be 24. Just because the calendar says I’m 24 doesn’t mean I feel it though. Some days I do–some days I feel much older than that, as though the sheer magnitude of what I’m thinking about and dealing with has certainly added years to my calendar. Other days, I feel as though I have so much to learn, so much to experience, that I must certainly be years younger. But everyone gets the same number of days by the time they reach 24, we just spend them differently. Lately I’ve been realizing how little I have figured out. It seems so foolish of me, but the truth is that I thought very little about what life after college would look like. In school I could see to graduation, and maybe a ways past that to a job, but after that it was blank. Or, to be more accurate, I had thought of it, but it looked different than my reality. In many ways, I’m still learning to give up the white dress. Now, having been at my job for a year, I’m facing the blank, asking why I didn’t consider it much before, and looking at this upcoming year and wondering what I’m going to do with it. There’s so much I have to learn, so many places I have to go, so many different ways I could fill this year. And the gift I really need, the one that should follow and cover and surround me through all of it, is grace. I don’t even begin to have this “life” thing figured out. I don’t even begin to have this faith and Christianity thing figured out. I don’t begin to have this family and friends and loving people well thing figured out. It doesn’t help anyone when I pretend like I do. Instead, I need to give myself the grace and the space to say, “I don’t know” and be okay with it. I want to free myself from needing to have things planned out or to know it all, because I can’t. Certainly not at this age, or any age for that matter. 24 feels old in some ways, but in a lot of ways, it doesn’t and it isn’t. There is so much of my story to be written, and I can’t fast forward or find an answer key to get me to some elusive state of “arrival.” I just need to live. So for my birthday, I’m giving myself the grace to be what I am. p.s. What do you need to give yourself this year? Over the last few weeks I spent time thinking about what I’m thankful for. As I thought about how my life looks like right now, I came to appreciate in a renewed way how full of goodness it is, from people to my job to my living situation to my church to the variety of other activities that fill up my time. And it’s times like these, when life is going fairly well, that my “I don’t like change” tendency kicks in in high gear. My own future looks reasonably steady, but it’s not necessarily that way for the people whose lives intersect with mine. It’s when I’m looking down the road, knowing people’s situations are going to change that will inevitably change me too, that make me want to stop time. I want to wrap my right now in a warm fuzzy blanket, clutch it close to my chest and hold on for dear life. That’s not a good way to live, for my own hands and arms that cramp as they cling so tightly, and for the things I squeeze so tightly they threaten to break. What would it look like if I lived differently? Life with open hands. It would look like accepting the good things I’m entrusted with for however long I am supposed to have them, and graciously letting them go when they are no longer mine to hold. It applies to almost everything in life, from relationships to jobs to vehicles to houses to memories. Most of what we come in contact with on a daily basis is temporary. Which, for a change-hater, is kind of terrifying. This idea of living with open hands is more of an attitude than a daily, physical action, which in ways makes it all the more difficult. If all I had to do was physically open my hands, I’d be set. Done. But metaphorically opening my hands is a much more nebulous idea, yet somehow seems exceedingly important. Of course, there are certainly times when we must hold tightly, even despite frustration and hurt and difficulty. Some relationships, jobs, vehicles, houses, and memories should be held onto, and that is well and good. But I’m learning there are less of those things than I once thought. p.s. What would living with open hands look like for you? I put up a Christmas tree by myself yesterday. In years past, I’ve put up small trees–in my dorm room, apartment, or parents’ basement, and I’ve always loved helping my mom decorate their house for Christmas. But this felt different. I put the stand together, carefully screwed the base of the tree in place so it wouldn’t move, fitted each section together, strung the lights (twice, actually, cause the first time didn’t look very good), then hung my set of Target clearance section plastic ornaments. I was pleased with how it turned out. In ways it was nice to decorate by myself. I went at my own pace, picked whatever Christmas music I wanted to listen to, and got to decide which ornaments went where, occasionally rearranging them multiple times (I just moved a couple more after writing that sentence). It felt a little weird though. There’s something about Christmas trees, and the season in general, that speak of home and family and warmth and coziness. I really like my current living situation, but I can’t let myself forget that it’s temporary. This is the only Christmas season that tree will spend in this living room, and it’s the only one I’ll spend living here as well. As comfortable as I sometimes feel in this stage of life, yesterday was a reminder that things can still be a little weird here. This whole holiday season, starting next week with Thanksgiving and stretching through New Year’s, is going to be a new kind of experience for me. I’ve always had weird work hours through the holidays, and now I’ll be working almost completely regular ones (though I’m taking a few days off). I’ve always gone home to my parents’ house or already been living there for most of the month of December, and now I’ll only be there for a few days around Thanksgiving and a few more around Christmas (and even then, it’s mostly because my roommate would likely be gone and I can’t bear the thought of waking up in an empty house on a holiday). I’ve always looked at the new year as the start of a new semester, and now, it will be just a new date on my emails at work. Considering how notoriously bad at change I am, I’m not dreading these changes as much as I thought I might. It is different though, and I’m grappling with the realization that this is what adulthood looks like. Or at least my own version of it, for right now. Decorating a tree by myself, working nearly regular hours, only spending a few days here and there at my parents house. A grown-up Christmas, I suppose. p.s. How did you deal with the changes adulthood brings about, especially when it comes to holidays? I’m writing this in the basement of my parents’ house, enjoying the Wi-fi that we don’t have yet at my new house (which also explains the lack of new posts lately). But unlike the other times I moved, this time everything came with me. Bookshelves, off-season clothes, all the little “life-y” bits I’ve accumulated over the years–they all came along. My room here, in this house where I sit right now, isn’t really mine anymore. Soon, my parents will redecorate and it will become the room my nieces and nephews play in and sleep in when they come to visit. When I visit, I will have no room to claim as mine. This is what is supposed to happen. Kids grow up, move out. And then, the kids have to find out for themselves what “home” means. There is an element of it that is physical, of making the house I live in now comfortable and somewhere I want and like to be. I want it to be the type of place where I can invite people over and that they will enjoy being. “Home” is much more than mere physical space, though. It is a concept, a feeling that is often attached to the physical, yet so much more. The people you’re with can add to, or even become a sense of home. This is, I know, one reason I don’t know what home means for me right now–because my circumstances of moving out at this stage in life are not what I expected. But maybe my concept of home has become too rooted in the external, and not nearly enough in the internal. Perhaps feeling at home is a choice of making peace with my circumstances. Maybe it’s about learning to appreciate this season of life God has me in right now, even though it’s not where I would have placed myself. Maybe “home” is about creating enough of a sense of it within me that I can carry it with me wherever I go. p.s. What does “home” mean to you? A little over a year ago, I graduated from college. At the time, I was incredibly uncertain, nervous, and kind of sad to be leaving a stage of life I wasn’t quite ready to be done with. On top of that, I was frustrated at what seemed like silence about the turmoil I was entering. Though in my conversations with friends we agreed that we were apprehensive about the future, there didn’t seem to be many people talking about it. Turns out, there were, and are, a lot of people talking about the chaos of being a twenty-something–I just hadn’t found them yet. When I first discovered All Groan Up, I think I breathed an audible sigh of relief. There are people who get this, and they’re writing about it! I’m not on an island of confusion and uncertainty by myself–there’s actually a LOT of people on this island! The founder, Paul Angone, wrote a book called 101 Secrets For Your Twenties that released this week. I’m glad he wrote it when he did–since I’m only 23, I still have several years of being able to appreciate and apply the wisdom. Honestly, there are some secrets in here I don’t like. It’s not because they’re not intelligent, but because I don’t like to think of how they’ll look in my own life. Failure, on some scale, is a reality of being human, and certainly of being a twenty-something. But I’d really prefer not to have to experience it myself. Change is something I’ve already done some of in my twenties, but I can only imagine I’ll be facing a lot more of it, and probably not liking it very much. 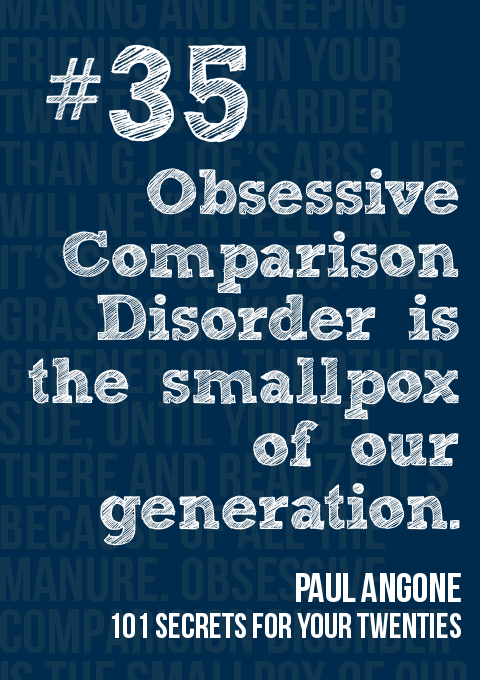 And Obsessive Comparison Disorder? Some days I feel like I might have majored in it in college. If I could add one more secret, one more for myself than anyone else, it would be this: Different is okay. When I compare myself to others, as I do far too often, I have to continually remind myself–our lives are different and that is okay. The goodness and trouble in their life is their own, and the goodness and trouble in my own life is mine alone. Different things are good for different people. Different is okay extends beyond my tendency for comparison as well. I’m learning to appreciate differences of opinion and belief, for the ways that it challenges and enforces my own, for what it teaches me, and for the beauty in saying, “We’re not the same, and I respect you.” Different might mean disagreement, but it doesn’t have to be ugly. Different is not a bad word. Different is okay is for me, too. When I feel different for any number of reasons–for being young, for being the single person at a table full of married people, for having nothing to say about mortgages–for a time, I may feel different, but different does not mean bad. It’s not easy. There’s not really much about growing up that’s easy, despite how some people make it seem. So it’s good to know we’re not alone, that there are others feeling uncertain and frustrated and confused…and that different is okay. p.s. What is one of your secrets for twenty-somethings?